The Globex GEC1 Standard Evacuation Chair enables one person to evacuate a physically impaired person safely and easily down stairs in the event of an emergency or when lifts can not be used. The Globex GEC2 Carry Evacuation Chair enables one person to evacuate a physically impaired person safely and easily down stairs in the event of an emergency or when lifts can not be used and also has carry handles for two people to carry one person upstairs and over obstructions. The GEC3 is a narrow version of the GEC2 aimed at the aviation industry and for use on narrow staircases. The Globex Economy GEC5 Evacuation Chair enables one person to evacuate a physically impaired person safely and easily down stairs in the event of an emergency or when lifts can not be used. 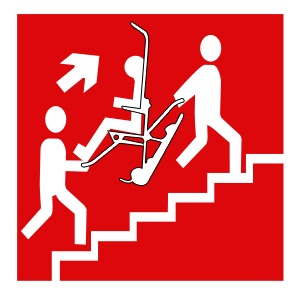 The GEC6 enables one person to evacuate a physically impaired person safely and easily down stairs in the event of an emergency or when lifts can not be used and also has carry handles for two people to carry one person upstairs and over obstructions. 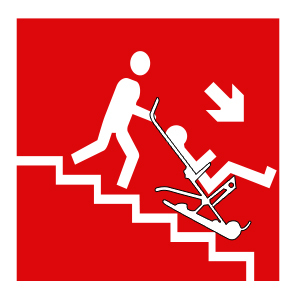 The GES1 Evacuation Sledge enables two people to evacuate a physically impaired person safely and easily down stairs in the event of an emergency or when lifts can not be used. Ideal for care homes and where people are unable to use evacuation chairs.